Many times, it’s the sales team that receive all the credit for new orders, or the engineers when commissioning. However, it requires teamwork to finish a project, there is production, purchasing, warehouse staff not forgetting the transport companies involved. The last days have been busy for our warehouse staff. Not only the usual store work, but with a new delivery including the loading of several large containers to Thailand with newly manufactured machines. It requires accuracy and precision when loading, every centimeter is important. 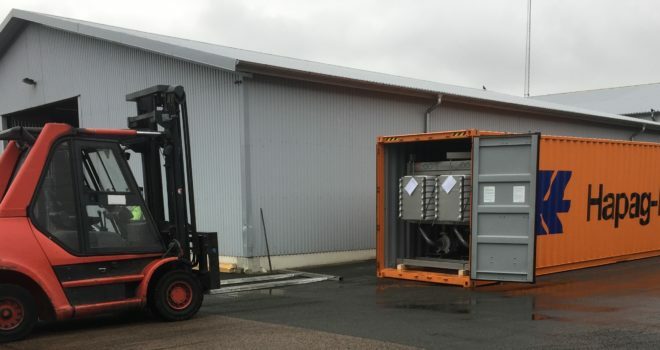 Cooperation and teamwork are also important as to correctly and safely place the machines either in the container or on the trucks, the goods are securely lashed as to enable a safe and secure transport. We have a competent and experienced warehouse staff, who work with these challenges on a weekly basis, this enables a smooth transition from workshop to customer, nevertheless each new loading is just as important as the previous shipment, whether it is a container loading or loading of trucks. 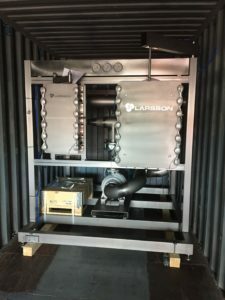 While transport not is LARSSON core business, we critically selected professional partners to provide our customers with a best shipping service as possible. Since 2016 we have a cooperation with vChain logistics, a company specialized in supply chain management. vChain acts as a control tower for all LARSSON’s transports worldwide and is an integral part of LARSSON’s supply chain concerning transport logistics. When the machines leave our premises it’s with a mixture of pride and elation. Not only from the sales team but from all the employees involved in the process.